In Mesopotamia and Ancient Rome the entrails of animals, particularly those of sheep, were used to divine the future. Clay models of livers survive sometimes with grids etched into them, some models containing holes. Such ‘fortuitous’ holes were likely caused by parasites and inscriptions on livers suggest that, along with ‘abrasions, blisters, scars, fissures’, these markings are ominous. [A] In liver divination the future is read through subtle differences with, and deviation from, what is considered to be normal; the normal surface texture, the normal gall bladder length. Often photographs of model livers, because of the clay material and the holes, inadvertently mimic the look of birds’ nests burrowed in earthen walls and the faces of sandstone cliffs. Below ‘Nesting’ two subtle but large wall pieces spread out from the corner, ‘Ocelli (auspicious)’ and ‘Ocelli (inauspicious)’ are a near, but not precise, mirror of one another. Made from cow hoof repair nails—long silver spikes, thin and narrow—the pattern and their name ‘Ocelli’ echoes the classic ‘eye spots’ found on moths and butterflies. These spots deter predators by mimicking the eyes of larger and potentially more dangerous hunters. Although how or whether this capacity is accidental, or whether the moth or butterfly is aware of their visual power, is up for grabs. [F] One thing is certain, the perspective the moth or butterfly has of their pattern differs from the flat mirrored views often presented for our eyes. 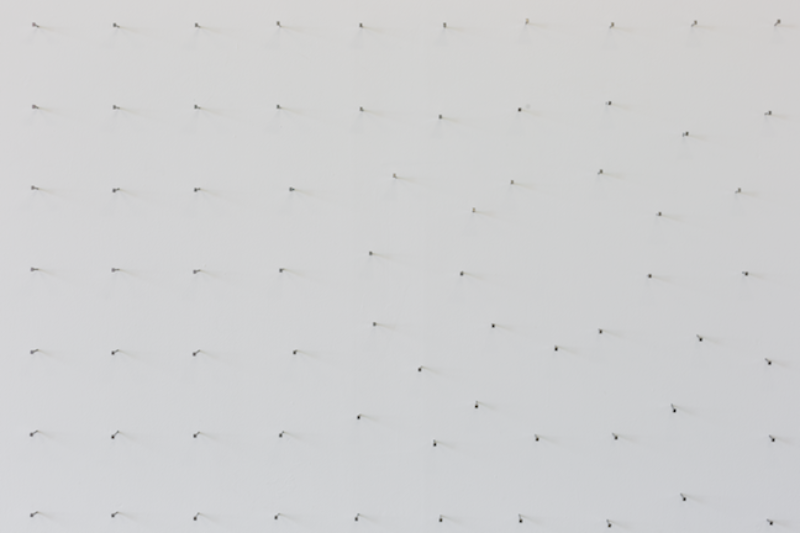 Tiny injuries inflicted to the wall by people hammering nails to construct the piece evokes the method of determining how the normal pattern of the eyes spots develop: ‘Pupae have their pre-formation wings cauterised, each in a different place’, once the butterfly or moth has grown the deviation from the normal can be noted. [G] Large numbers of individual butterflies and moths are sacrificed in systematic attempts to provide a general explanation of how they, and others of their species, have come to look a particular way. Studies furnish biomedicine with general understandings of how patterns form and wounds heal. Trying to sum something up, to produce a general understanding, requires literal deaths: the experimentation with the pupae and then the living butterfly or moth [H]. Killing for, and through, analysis. As with the liver, the future is stabilised through animal sacrifice. Sacrifices perhaps considered justified in relation to the incapacity of animals to understand their ‘being’. But do people know or understand—can they see the complexity of what they are embroiled in—are they not just differently conscious? These questions over ‘being’ signal Heidegger’s chequered presence in the thinking surrounding this exhibition, as does the trope of crossing out the titles. 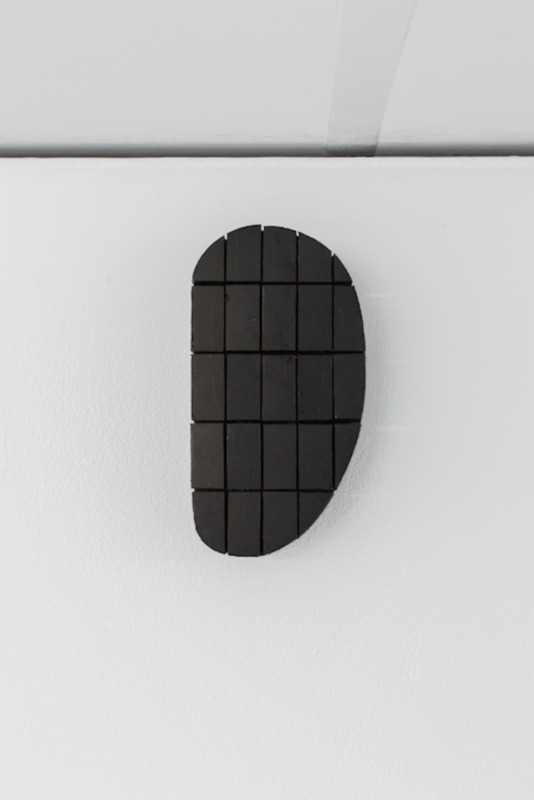 ‘Nesting then’, an irregular object in the space, dark and flat, resting above and to the right of the ‘Ocelli’. Perhaps liver sized but not quite liver shaped, more like an ear, a piece of High-Density Polyethylene (HDPE) black plastic, a hatched relic of modernism cut from a ventilation duct. The object mimics the rubber blocks routinely nailed, with those long silver spikes, to one side of the hoofs of cattle reared for milk and meat production. An adjustment that shifts the balance of the cow’s weight. When applied correctly, the rubber nail-on block changes the gait of the cow and protects against and prevents lameness; when incorrect, it leads to infection and pain. Rather than nature providing a solution, engineering is applied to nature. The knowledge produced through scientific research is systematic, dogged. In contrast, this exhibition is associative; bringing materials, metonym and thoughts together in a non-prescriptive way. 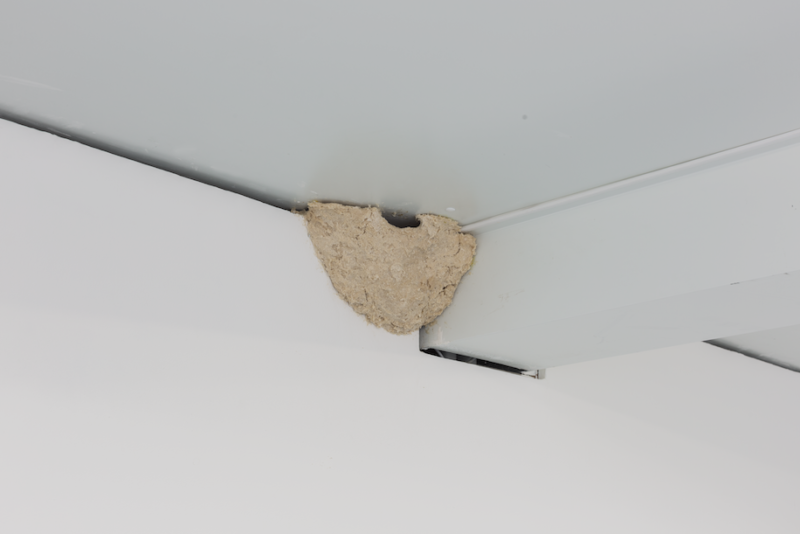 In some of the works, such as ‘Nesting’, animal remains may form the substance of the work. Just as our faces may be covered in chitin, products of technological processes frame the exhibition within the material of the walls, the windows, the surface paint. Birds’ nests, sculpted, regular and mass produced, can be bought and installed in gardens. Works here can be replicated but not readily removed, rehoused or sold. Detaching ‘Nesting’ damages the integrity of the chitin structures. Collectively the cow hoof repair nails are intentional sculpture, individually they become disaggregated fragments with a specific practical function. ‘Nesting then’ can be relocated, retaining its shape but not its context. The exhibition, the works, are represented by photographs, preserved in this text and Collective’s online archive. But none of these express the movement of a person or people in the space, or the evaluation of nails and nests against the specific materiality of your own human body. Thanks to Barry Burns, Alex Impey and Katherine MacBride for commenting on an earlier draft of this text and to Alex Impey for providing access to relevant sources of reference. [B] Stephen Nicol, 1991, Life after death for empty shells: Crustacean fisheries create a mountain of waste shells, made of a strong natural polymer, chitin. Now chemists are helping to put this waste to some surprising uses, New Scientist, Issue 1755, February 9th. [D] Jeanne H. Bottin, Jonathan R. Swann, Eleanor Cropp, Edward S. Chambers, Heather E. Ford, Mohammed A. Ghatei and Gary S. Frost, 2016, Mycoprotein reduces energy intake and postprandial insulin release without altering glucagon-like peptide-1 and peptide tyrosine-tyrosine concentrations in healthy overweight and obese adults: a randomised-controlled trial, British Journal of Nutrition , Volume 116, Issue 2, July 2016, pp. 360-374. [E] Mostly closely associated with the top class Mo Farah although new Olympians are now fronting the brand. Mike Dennis, 2016, Olympians star in new TV ads for Quorn. Talking Retail . 23 December. [F] Martin Olofsson, Hanne Løvlie, Jessika Tibblin, Sven Jakobsson, Christer Wiklund, 2013, Eyespot display in the peacock butterfly triggers antipredator behaviors in naïve adult fowl. Behavioural Ecology , 2013; Volume 24, Issue 1, pp. 305-310. [G] Notes supplied to Collective by Alex Impey. [H] Yawen Zou, 2010, “Development, Plasticity and Evolution of Butterfly Eyespot Patterns”(1996), by Paul M. Brakefield et al. Summary of research.